This weeks TSSC is a little out of my comfort zone - the sketch felt like a CAS look to me. CAS is not something I do often, as I tend to reach for sponge daubers or distressing when I'm creating. I cut my DSP to 3" x 3" then cut in half on the diagonal and in half again - giving me 4 triagular pieces. I flipped two of them over so my patterns would alternate to form the back panel. I layered these onto a piece of Baja Breeze where the edges were punched with the Lattice Edge Punch. 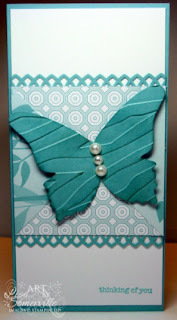 The diecut is from the Bigz Beautiful Butterflies, then emobbsed with the new Tiger Prints Embossing Folder from Sizzix. To add color to the embossed areas, I used the CuttleBug Highlights Technique from a past TJNL issue. This is so lovely, Lisa. I appreciate your explanation, too. The color.....fabulous! I really luv how you used the embossing folder, that was a great trick GF! If it was CAS, it ain't no more! Great card!! I think this turned out fantastic, you did a great job with this hard sketch. I agree, you did a great job! I love your color choices and the textrure added to the butterfly is perfect! I knew you would rock this! gorgeous card...love all the pattern and detail. I need to buy that punch...great blog - you are so talented. Wonderful sketch card, Lisa! Love the textures you did on the butterfly. I love that you used the embossing folder as well!